Seriously it really is the best…and I’ve made a LOT of cranberry sauces. It’s the one thing I like to do differently every year for the holidays. Mostly because it’s so easy to make (I am definitely in the ANTI-CAN group; never loved it and never will!) but also because I think it’s really versatile. I’ve added maple syrup and vodka, toasted walnuts and more. One year I thought I would try a spicy Asian version with jalapeno and Chinese Five Spice; you won’t find it on this blog…that was a Mistake with a capital M! I think this is the best because it seems to have such a down home quality; it’s not sophisticated like this Cosmopolitan Cranberry Sauce (that’s the vodka one) but I already know it’s going to be great on my most favorite ever of all Thanksgiving dishes…this sandwich the day after! I tried to forgo decided that the only boost it needed was a splash of orange liqueur…oh how I love to use booze when cooking! The spices are both warm and sweet and using apple cider and brown sugar instead of water and granulated sugar is a must that I’ve learned makes all the difference. Try it; I know you’ll love it too! I had high hopes of putting together a post with all of my favorite Thanksgiving dishes and including this new one in that list. That effort escaped me but a better one came about anyhow! The folks with World Vision asked if I would share with my readers the World Vision Gift Catalog that they’ve put together. What better time than this week when we give thanks for all of our blessings to think about those who are not so blessed; who struggle with the bare necessities and that includes the food that most of our tables will be groaning with tomorrow. They offered me the opportunity to host a giveaway of the cinnamon box shown above but I hope that every one of you will understand why I deferred…I would much prefer that their monies go to help the lives of children, adults and communities in the US and around the world in many different areas of need; clean water, food, education, sexual exploitation, job training and more. More than 30 gifts in the catalog are $35 or less and 85% of of World Vision’s total operating expenses are used for programs that benefit those in need. Won’t you help? How meaningful it would be to offer a gift to someone that they will treasure but also know that it is doing good for someone less fortunate. Combine all ingredients in a medium saucepan and cook about 15 minutes over medium heat, stirring occasionally. The sauce is done once the cranberries have all popped and most have lost their shape and the liquid has evaporated. Remove ginger, star anise and cinnamon stick and put sauce into a bowl. Refrigerate for several hours or overnight if possible. Do you put the star anise and cinnamon stick in whole or grind them up beforehand? They go in whole Beena with the pieces of ginger and then after all is cooked you remove them. I’ve revised the recipe a bit to make that clearer…thanks! OK Barb, this year I’m going non-traditional and this is the one I’m going to try. Can’t wait! My vanilla beans have been ordered and I’ve got cider ready to go. It went over VERY well…disappeared and we made a quadruple batch last night that the neighbors begged for. Love making people happy…including you! Hope the same for you Greg! What a beautiful cranberry sauce! I love that it’s the one thing you do differently each year. I bet family and friends look forward to trying each new creation. This one sounds wonderful! This sounds wonderful. I bet the combination of spices and liqueur are fab. 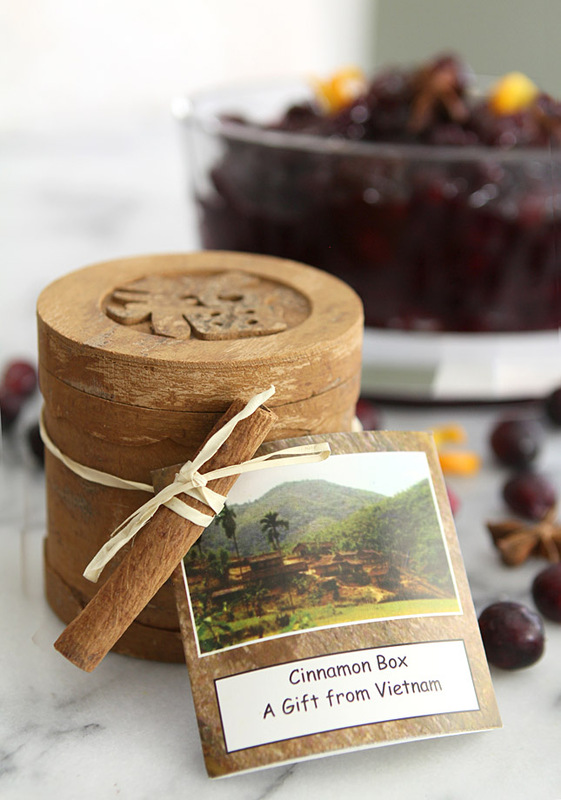 Also lovely is that cinnamon box – and I applaud your decision about keeping the funds flowing directly to those most in need. Well done! Happy Thanksgiving to you and yours! Sounds and look great, lovely pictures too! Happy Thanksgiving to you Barb! 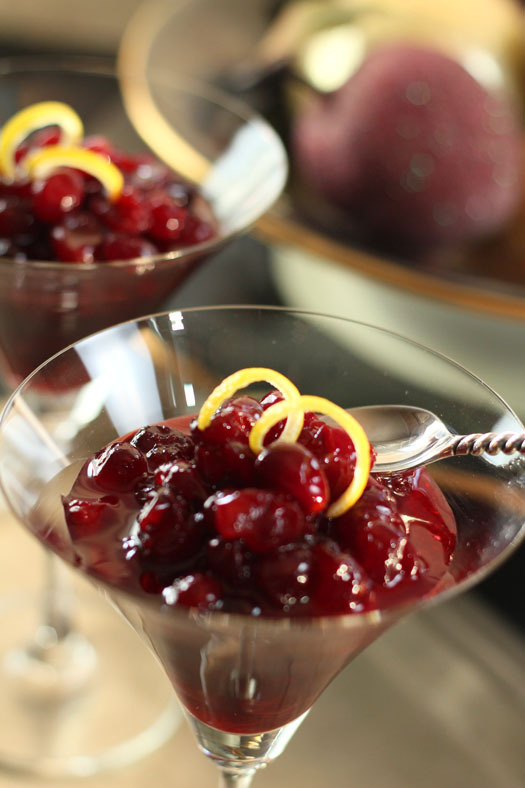 After viewing the ingredients, I think you might be right about this cranberry sauce! I love trying out new cranberry sauces and this one looks great! I’ve never incorporated booze into mine before, but it sounds like a delicious idea to me! I admit I cook with booze a lot; I love the subtle addition it can make to so many dishes. Oh Barbara, you are making me wish I could get my hands on fresh cranberries! Your sauce looks and sounds exquisite… and your photos are jaw dropping! This looks so good. I have never made homemade cranberry sauce. I have only ever had the canned stuff 🙁 Maybe I should run to the store before tomorrow and make this instead. Oh my gosh GO. It’s simple as can be and you will never EVER regret it or go back. I promise. Even without the liqueur..homemade is the best. Then get stuff for that sandwich I linked to. SO good! Happy Thanksgiving. Thanks so much! I’m super excited to make this!! With all the ingredients listed in this recipe it must have smelled wonderful heating on the stove. Looks and sounds wonderful Barb. Great that you are promoting the efforts of World Vision at this time of year, very appropriate. 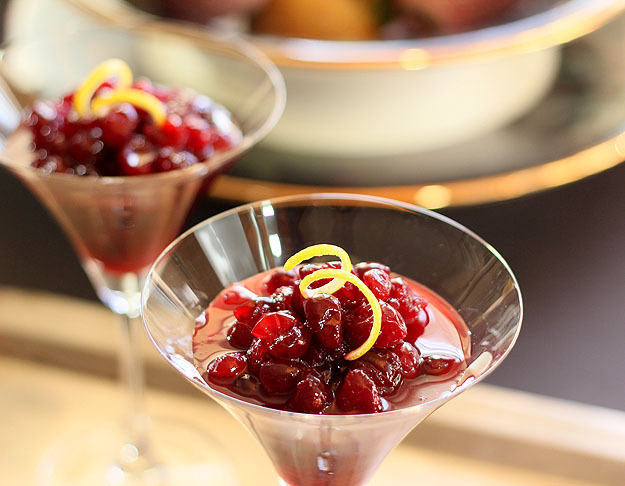 You’ve outdone yourself this time around with your cranberry sauce. It would be a welcome addition to any Thanksgiving table. I may make mine with port this year if I make it to the liquor store today. Have a Happy Thanksgiving! 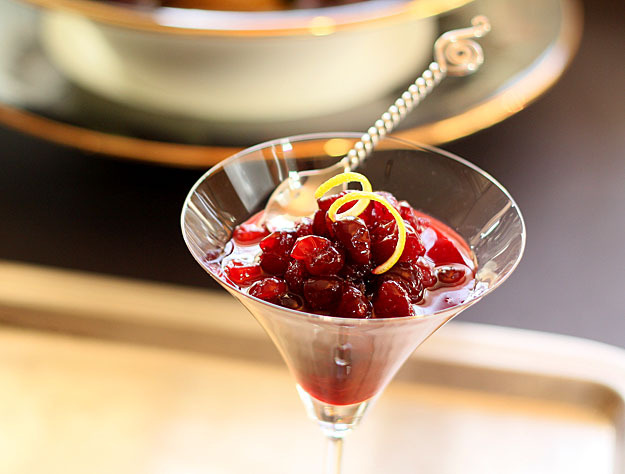 I’ve used Cointreau before in a cranberry relish dish, although not in sauce. This looks truly delish! Love the inclusion of ginger and cinnamon. Thanks for this, and I hope you have a great Thanksgiving.